Baritone guitars have a long history in rock and country, providing everything from extra low end to surfy twang to tic-tac bass (‘Six Days On The Road’ by Dave Dudley comes to mind). These days, they are most often used in heavier rock styles, as they emulate the low six strings of a seven-string axe very well without the player having to learn a new physical landscape. 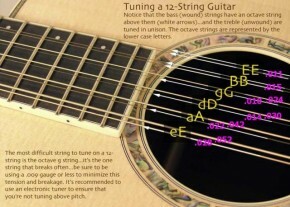 They are typically tuned B to B in a standard tuning configuration, but, like a regular guitar, can be re-tuned to suit the player and style at hand. The best thing about a bari for heavy rock is that you get the same sounds as a de-tuned conventional guitar puts out, but without the often soft/mushy feel they can have due to the bari’s longer scale length and heavier strings. The Paul Reed Smith SE Mike Mushok Baritone Guitar is an excellent choice for those looking to put the low and heavy hammer down in rock and metal styles without breaking the bank, as it retails for $930.00. It is made of mahogany and features two humbucking pickups and this combination makes it sound positively lethal when pumped into a high-gain amplifier. The Mushok is built around the same body as the PRS SE Custom but some important differences, the main one being the 27.7-inch scale length as opposed to the 25-inch measurement found on most PRS guitars. This allows the Mushok to be tuned lower without losing string tension, which is important to many guitarists. It also features neck and headstock binding, an inlay-free ebony fingerboard, a string-through-body stop tailpiece, silverburst finish, and a three-way blade-style pickup switch. The body is flat-topped and all mahogany but feels surprisingly light when picked up. Hardware found on the Mushok includes two knurled chrome knobs for volume and tone, non-locking PRS-designed tuners, and PRS-designed Treble and Bass humbucking pickups. The Mushok fits very well into the gap between a guitar and an electric bass and, like many baritones, requires little or no transition for the player. It may be one of the best choices on the market for rock and metal rhythm playing. It has enough output to drive an amp, but it still retains focus and never turns to mush. The three pickup combination give guitarists the tones they would expect in this kind of instrument and can cover many bases. If drop-tuned rhythms are what you crave, the Mushok could be exactly what you need to drive your point home. Now, if PRS would make one with a trem for all us surf music fans, it would truly be a perfect world. 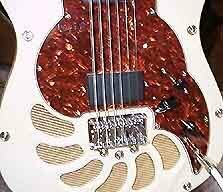 I just heard Staind last nite and this model of the PRS guitar that Mike used rocks. It was exactly the same, and I heard he recorded the recent album with this model and not the signature one…amazing sound.